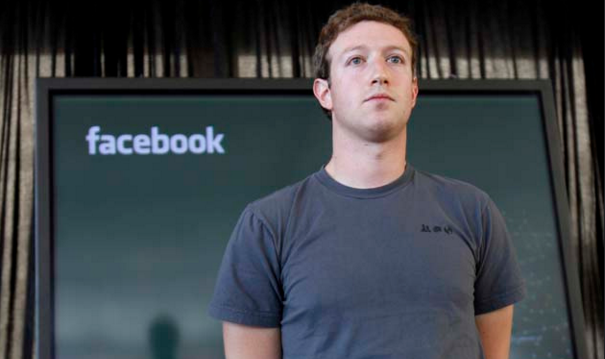 There is a reason very successful people like Mark Zuckerberg choose to limit their wardrobes. GRAY SHIRT EVERYDAY. 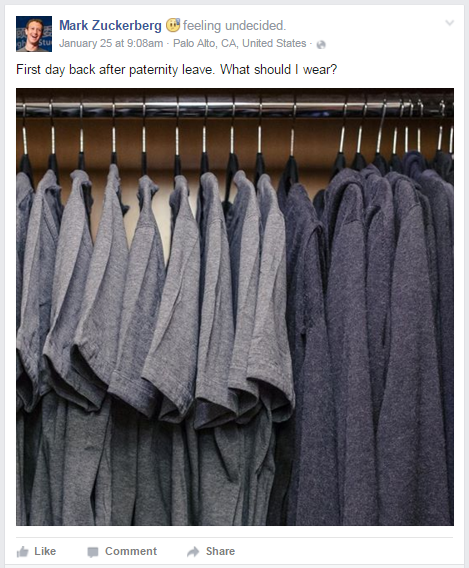 Coming from his paternity leave, Facebook CEO Mark Zuckerberg posts (or jokes) on January 25 a photo of his closet – all gray shirt there – and asks "What should I wear?" An old adage wants us to believe that "clothes make the man." The implication here is that we should strive to dress formally and professionally. However, in recent years the wardrobes of many successful men and women have leaned toward casual. A billionaire tech company CEO is more likely to be seen in jeans and a t-shirt than a business suit. In fact, in later years, Steve Jobs was rarely photographed wearing anything dressier than casual clothes and sneakers. The result was a more warm, approachable image that let the world know his first priority was business. For great minds like Jobs, Facebook's Mark Zuckerberg, and even Albert Einstein, wardrobe choices have more to do with time and energy than comfort. Like many other brilliant people throughout history, these men simply did not waste space in their brains for clothing. Wherever you are in your career, scaling down your outfit can help you in a variety of ways. While he does not wear the same outfit every day, President Barack Obama chooses to wear only gray or blue suits in order to "pare down decisions." When you spend 10 minutes trying to choose between the outfits crammed into your closet, you waste 10 minutes that you could have put toward decisions about your business. The effort may also distract you from a productive train of thought about your newest project or a presentation you will be giving later in the day. A full wardrobe requires spending time shopping, in addition to the time you waste pairing shirts and pants each day. Even if you have a favorite store, you will likely need to spend an extensive amount of time each year browsing racks and trying on clothes to find the right look. When you settle on a top and bottom that fits well and looks good, you do not have to return to that retailer until your existing wardrobe begins to wear out. 3. Free up closet space. Organization experts say the average person wears only 20% of his or her wardrobe. If that describes your own closet, you are likely dealing with wasted space that could be put to something else. Purchase enough of your "personal uniform" to get you through several days without washing and use the extra space as storage. 4. It becomes your signature. People often think of hoodies and jeans when they picture Zuckerberg. Jobs was known for his mock turtlenecks and jeans. You can establish your own look that will become your signature, setting you apart from the many others in your field. Your look does not have to be completely casual. You could opt for button-down Oxfords and khakis or golf shirts and jeans. Whatever you decide, make sure it is versatile enough to move from the boardroom to late nights at the office. You may even want to keep a dressier outfit around for special presentations where professional attire is expected. If you are building a business, you will likely need to put every dime toward supporting its growth. This means every dime you save on clothing is money you have to put into your business. Wherever you are in your career, you can always use a few extra dollars each year. A full wardrobe costs money and if you are not wearing the vast majority of the clothing you buy, most of that money is wasted. There is a reason very successful people choose to limit their wardrobes. You do not have to wear the same outfit every day to save time, money, and mental energy. You can purchase a few simple items that can be easily paired with other items in your wardrobe to keep you from spending much time matching every day. The result will be a streamlined process that allows you to get ready to work more quickly every morning.